Wicks Brothers built roughly 90 picnic-style powerboats from 1930-1940. 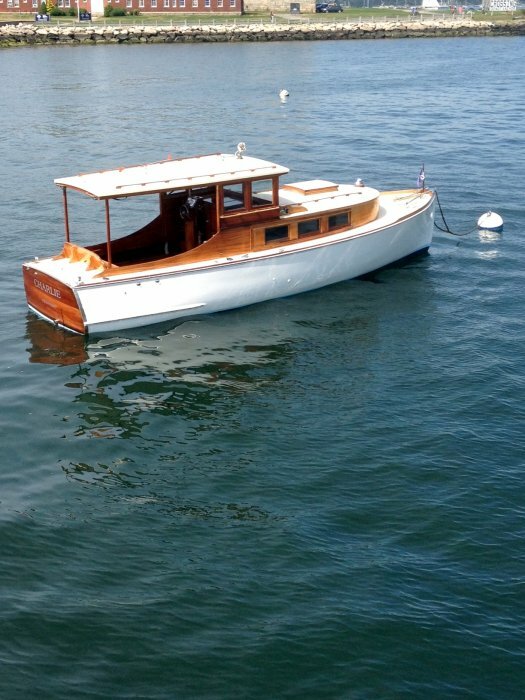 Many were originally shallow draft workboats for Long Island Sound, but the boats’ clean lines and classic look quickly caught the attention of recreational boaters and several were commissioned to be built. CHARLIE was one of at least three boats commissioned by John Vanderveer in 1931 to be built by the Wicks Brothers Boatyard... back then it was called JAY VEE (I). The Vanderveer family owned CHARLIE until 1938 when John Vanderveer commissioned John Wicks to build a larger 37′ cabin cruiser—JAY VEE (II)—which actually also still exists in beautiful restored form currently in Stonington, CT.
CHARLIE underwent a restoration at Derecktor Shipyards in the early 1990’s and was donated to the Museum of Yachting (Newport, RI) in 2006. 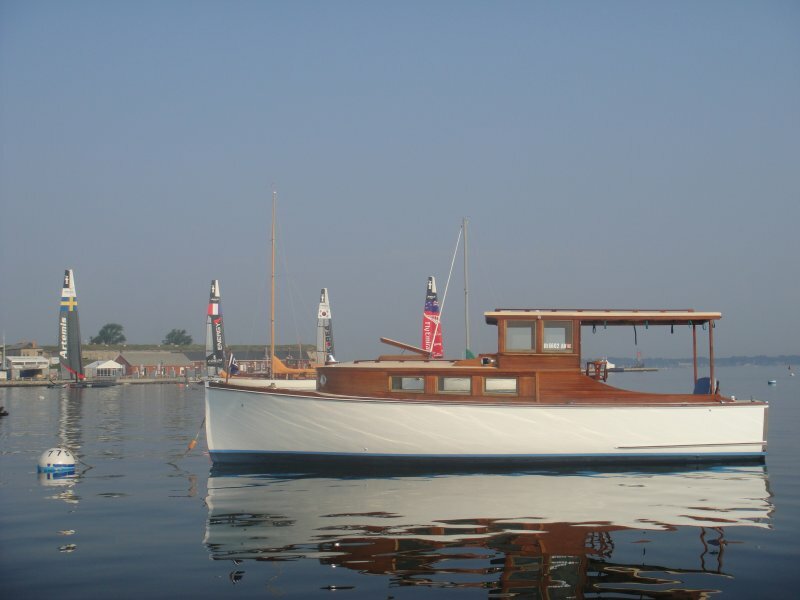 She was used for several years as a committee boat for the Classic Yacht Regatta and participated in several classic yacht parades in Newport Harbor. CHARLIE was mothballed in 2008, where she sat on the hard behind the Museum of Yachting until her current owner purchased her in the fall 2010. Over the winter of 2010/2011, a team of talented IYRS students went to work on scraping all of CHARLIE exterior woodwork down to bare mahogany. Along the way, a repair was made to a rotted area on the starboard foredeck, the engine water pump was replaced, a new distributor cap was installed (sourced from a farmer in Indiana), the planks were recaulked and 5 coats of varnish were applied to the exterior. The was given a quick (and somewhat amateur) paint job to both her hull and deck. 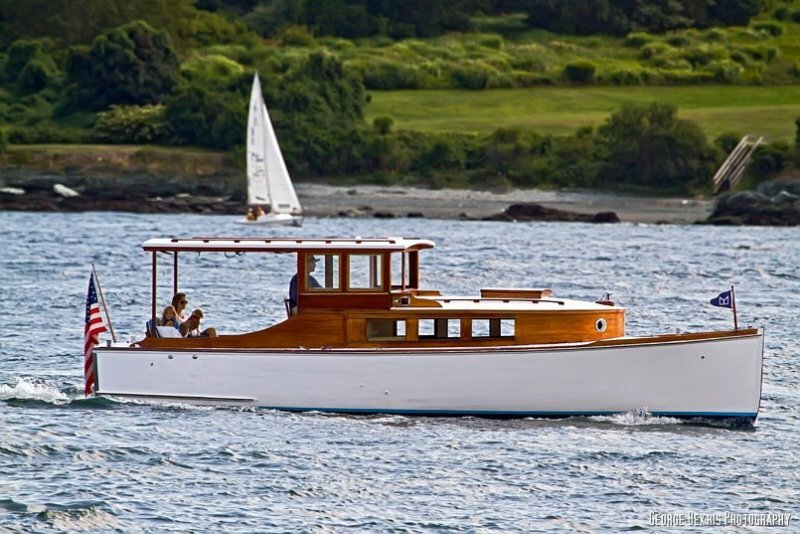 CHARLIE was re-launched in the Spring of 2011 and used that summer on Newport Harbor. 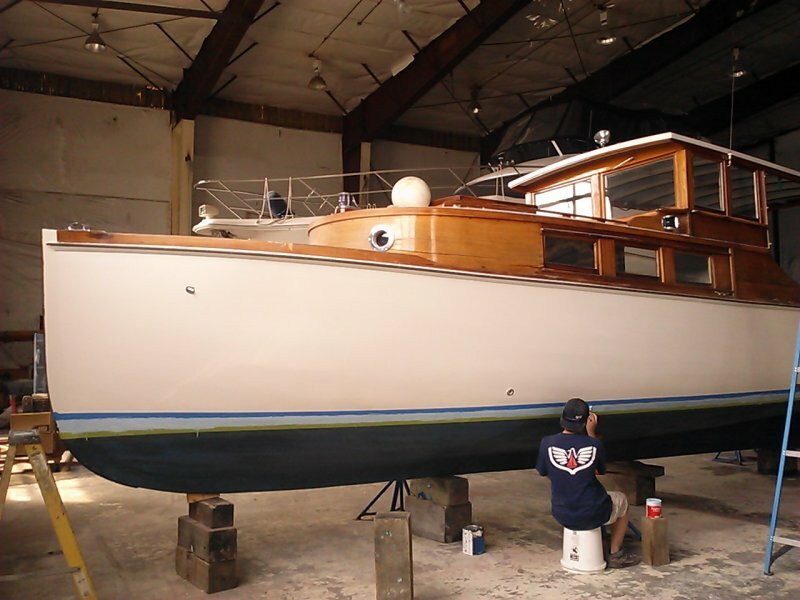 CHARLIE was hauled in the fall of 2012 at Newport Shipyard for the winter of 2011/2012, at which time we focused on restoring the interior, re-wiring the boat and replacing traditional lights with LED. Other advancements in electronics were added, to include a wireless DMK router which displays electronic information (GPS, heading, speed, water temp, depth, etc.) on an I-Pad or SmartPhone. 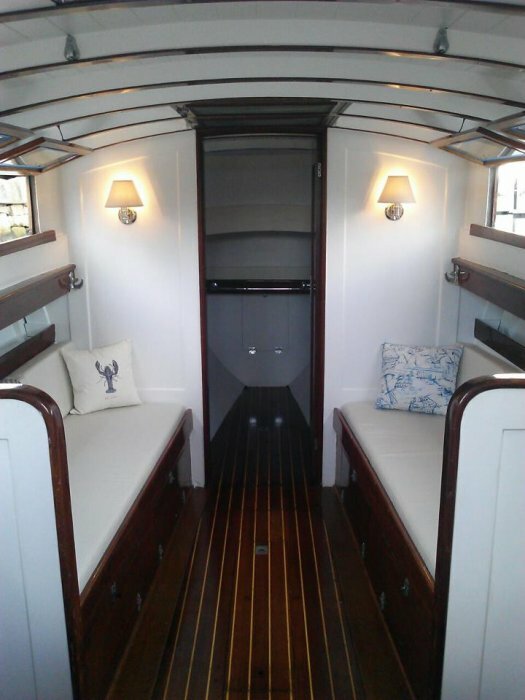 New cushions were made by Custom Marine Canvas our of Noank, CT, the cabin was completely renovated, a mahogany box was built to hide the head. Some thru-hulls from the old plumbing system were removed and planks scarfed in to cover the holes. 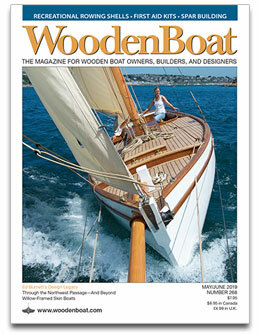 CHARLIE was launched in the Spring of 2013 was high hopes of doing some near-coastal cruising that summer. Unfortunately, she was T-boned as she sat on her mooring by her mooring neighbor, CHEROKEE (6-meter) during a 30-mph northerly on the first day of the NYYC’s Annual regatta. The damage was significant (2 ft. hole, midship, 1 ft. above the waterline)... we were luck she didn’t sink. After an emergency haulout at Newport Shipyard, the talented crew at J. Thompson Carpentry went to work on the repair. They included several new planks (frames were undamaged) and a professional paint job. Along the way, we repaired a rotted area along the port foredeck, replaced some suspect planks starboard aft and did a proper paint job on the deck. After missing most of the 2013 summer, CHARLIE was re-launched in August and enjoyed for the remainder of the season. She was hauled at Casey’s Marina (Newport) in November where she sits (inside) today in preparation for our winter work. On the list is going below decks to clean up and repaint the frames & bilge, re-paint the engine, build and install some new cabinetry in the galley and replace the combing around the front of the cabin house.